Here’s a filling fudge that’s not too sweet. 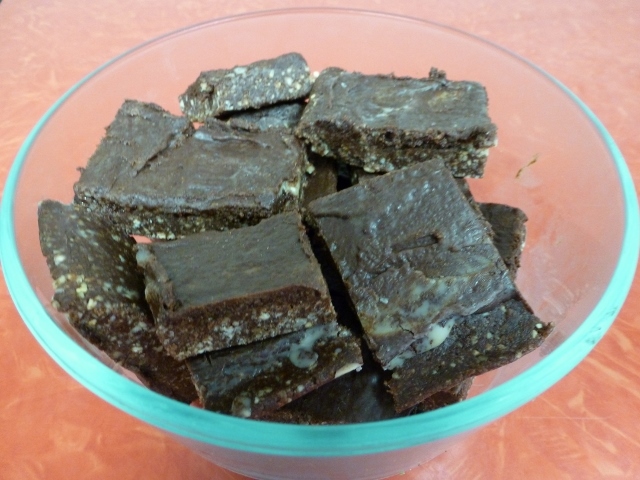 It’s mostly raw, involves no real cooking, and provides a delicious way to eat coconut oil and raw cacao powder. Be sure to find cashews that are not oiled and salted–you may need to go to the c0-0p or health food store. The egg yolk acts as an emulsifier and is not detectable in the final product, so I don’t recommend leaving it out. Besides, it boosts the nutritional value of the fudge. You could substitute coconut oil for the ghee but then you would miss the buttery flavor. Make the fudge base first. Blend the coconut in a blender or food processor until finely ground. Process the cashews separately until finely ground. Mix the two in the food processor and process until well mixed together. Add the cocoa powder, salt, and honey. Process until well mixed and forms a ball. Press evenly (easiest with your hands) into a pyrex baking dish that is lined with waxed paper (8 inch square works well). Cover and refrigerate while you make the icing. In the food processor (don’t bother washing it after making the base), process the honey, cocao powder, egg yolk, salt, and vanilla. Pour in the melted ghee and coconut oil while processing. Once mixed well pour over the fudge base and spread evenly with a spatula. Refrigerate until icing is set and firm. Cut with a knife or pizza cutter. Lift out squares and keep refrigerated. This is the easiest, healthiest fudge ever, so if you are going to indulge a chocolate craving this is one of your best choices! You may wish to adjust the amount of honey to suit your sweet tooth and you could use 1/2 organic raw cane sugar and 1/2 honey if you prefer. Depending on the amount of honey you use and the consistency of the honey you may have trouble getting the coconut oil to mix or emulsify with the cocoa-honey mixture–just add a raw egg yolk to aid the emulsification. Be sure to use an egg from a healthy chicken–pasture-raised and fresh, and inspect the yolk carefully when you crack the egg. Some optional additional ingredients are 1-2 Tbsp. whey protein powder, shredded coconut, chopped nuts, and dried berries–just stir them in before transfering the fudge into a baking pan. If the coconut oil is not in its liquid state, warm it by placing it in a glass or metal bowl and then placing that bowl in a pan of hot water. Don’t heat it on the stove–hot tap water will be sufficiently hot and stirring it as it melts will speed the process. The idea is not to warm the coconut oil more than necessary in order to preserve the enzymes natural to raw oil. While the coconut oil is melting, proceed with mixing the other ingredients. Place cocoa powder, honey, vanilla extract and salt in a food processor. Process until thoroughly mixed. Pour the melted coconut oil in through the top feeder of the food processor slowly while processor is on and process until thorougly mixed. Stir in by hand any optional ingredients you desire. Transfer the mixture with a spatula into a baking dish and spread evenly. Fudge should be about 1/2-inch to an inch thick. Place in refrigerator for a few hours to set. Once hardened, it can be cut and removed from the pan. This is the tricky part–you want to warm it just enough to make cutting it and removing the squares with a spatula easy. Place the pan in a larger pan containing some hot water. Within a minute or so the bottom of the fudge will loosen from the pan. Cut and remove the squares quickly before they melt too much and you have a mess! Keep refrigerated and serve cold.